While the OSR has produced fantasy games aplenty, the number of science fiction games has been relatively small. 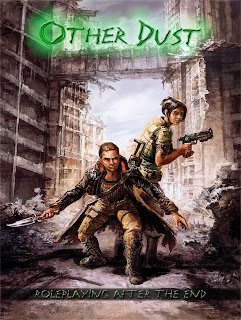 One of the most significant of these recent old school SF RPGs has been Stars Without Number, which is not only a fine game in its own right, but the first example of author Kevin Crawford's talent for producing extremely useful utilities for running sandbox campaigns. Very few other designers have produced such a wealth of material for the creation and maintenance of sandbox campaigns as Crawford and the fact that he keeps doing it, each time refining what he has done before and expanding on it, makes it all the more remarkable. So, when I heard that Crawford was producing a post-apocalyptic sandbox game, my interest was immediately piqued. Called Other Dust, it's actually set in the same universe as Stars Without Number and focuses on what became of "Old Terra" after humanity traveled to the stars and the psychic catastrophe known as "the Scream" washed over all of mankind's worlds, including his world of origin. Other Dust is 208 pages long, available as either as PDF (for $19.99), a softcover book ($34.99), or a hardcover book ($39.99). Like previous releases from Sine Nomine Publishing, Other Dust presents its material using a densely-packed two-column format. Black and white line art is more abundant here and is generally used to better effect, though, as always, it's the text and not the illustrations or presentation that matters most. There are twelve chapters in Other Dust, along with an index. The short first chapter ("The World Is In Ashes") is merely an introduction to the game's setting and conventions. The next chapter details character generation. Those familiar with Stars Without Number will find this familiar, with six ability scores identical to those of D&D and with the same range (3-18). Characters have classes (scrounger, slayer, speaker, and survivor), in addition to background packages. Classes provide attack bonuses, saving throws, hit dice, skills, and a unique ability, while background packages provide additional skills. There are also a variety of "training packages" associated with each class that provide further benefits. Characters can be further customized through rolls on mutation tables, if so desired, while starting equipment is entirely random. Chapter three details mutations, which are described as the effects of nanites released by Terra's Highshine planetary disaster response system to deal with the aftermath of the Scream. Unfortunately, the Highshine system was perverted by a group known as the Crazed, so the nanites don't function as they were supposed to, instead warping bodies in unexpected -- and often detrimental -- ways. Most mutations come with drawbacks in addition to benefits and the game mechanics associated with them are pleasantly brief -- on par with first edition Gamma World or Mutant Future. Chapter four details the game's basic "systems," like combat, saving throws, advancement, and so on. Again, readers familiar with Stars Without Number won't find too many surprises here. Other Dust uses mechanics very similar to those of old school D&D and its clones. Chapter five ("A History Writ in Dust") provides lots of broad details about the world before the End. The chapter not only shows how Old Terra fit into the larger setting of Stars Without Number, but what life was like on the planet. Similarly, the history of the two hundred years since the Scream is covered. These sections take up only seven pages of the entire book, but they're very useful in properly establishing what the game is about. Chapter six is dedicated to "Creating Your Wasteland" and provides extensive advice on how to create a post-apocalyptic sandbox campaign, complete with many, many random tables to assist the referee. It's here that Other Dust really shines, since each entry on the random table is given sufficient attention to inspire lots of ideas. It's fairly easy to create random tables, but far harder to give meaning to make those tables truly -- repeatedly -- inspirational, but Kevin Crawford has done so. Chapter seven is about "Adventure Creation" and, once more, offers advice and random tables to aid the referee, along with random loot tables. This chapter is solid but not quite as inspirational as "Creating Your Wasteland," but that's hardly a criticism. Chapter eight describes "Groups and Enclaves" and is another inspirational chapter. Crawford breaks down power groups and settlements into various types (Cabals, Creeds, Polities, etc.) and then provides specifically tailored random tables for creating them for insertion into a campaign. Likewise, the strengths and weaknesses of each are quantified in ways that work with the game systems introduced elsewhere. Chapter nine is devoted to "Equipment and Artifacts" and is as good as such chapters can be. Chapter ten is a "Post-Apocalyptic Bestiary" and provides both rules for creating opponents, in addition to plenty of examples of them. To my mind, that's the best approach to such things. Chapter eleven is a detailed Wasteland example called "The Bonelands," which represents one vision of what the northeastern coast of North America might be like in Other Dust. Chapter twelves contains "Gamemaster Resources," consisting of a wide variety of random tables, sample maps, encounters, and game stats. It's a good selection of material that will no doubt prove useful both in preparation and at the table. All in all, Other Dust is a formidable post-apocalyptic science fiction RPG. Its greatest strength is the vast amount of support it provides for sandbox play -- from advice to random tables to fully-fleshed out examples. Indeed, I'd recommend the game on that basis alone. Whether you're playing Other Dust or some other post-apocalyptic game, the vast majority of this book's content is a treasure trove of good ideas and inspiration. In fact, I'd go so far as to say that a lot of the material is just as useful for creating and maintaining a fantasy sandbox as a science fiction one. That Other Dust plugs into Stars Without Number is also to its credit, since it provides new avenues for adventure in that game. I'm hard pressed to find any weaknesses in Other Dust, since it does exactly what it set out to do: offer up rules for playing in and running a sandbox campaign set on a far future post-apocalyptic Earth. It's an excellent addition to the pantheon of RPGs, old school or otherwise. Buy This If: You're looking for a simple, flexible post-apocalyptic RPG that fosters and supports sandbox play. Don't Buy This If: You have no interest in post-apocalyptic RPGs or in sandbox-style campaigns. Though I'm not all that into post-apocalyptic roleplaying, I'm sure this entry in Crawford's lineup won't disappoint. I also love how his default setting flexible enough to allow any kind of science-fiction campaign, whether you actually follow the source material or not. Would all the 'sandbox utilities' work well with Mutant Future? Absolutely. One of the many great things about Other Dust is how flexible it is. Its utilities could easily be used with MF (or lots of other RPGs). Great review. As a Gamma World fan I am really interested in this one. Do the rules have detailed non-human options such as mutant animals, or creation guidlines similar to creating alien races in Star Without Number? There are beastfolk - humans that were hybridised with animal genetic templates by the emergency medical nanotech, and there are some notes on an option of letting them be player characters, but no specific generation system per se. Certain mutant animals may have come through with heightened intelligence, but it appears that more such creatures are actually devolved humans (there naturally having been more humans around to mutate) with reduced mental faculties. I just wanted to thank you for this review, as it helped me find my new favorite go-to Post Apocalyptic game. It's a genre I love (I even worked on the d20 revision of Gamma World) but is often saddled with heavy systems (Hell on Earth, the aformentioned d20 Gamma World) where the genre really benefits from an easily "wingable" system. I enjoy Mutant Future, but it is a little too gonzo for my tastes -- I prefer Wasteland and Fallout levels of grit-gonzo balance. Other Dust fits perfectly in that space, plus all the sandbox tools are great fun.